Although I'm sure Moleskine has crossed your radar once or twice in the past, it most likely was for its collection of notebooks, diaries, or pencils. 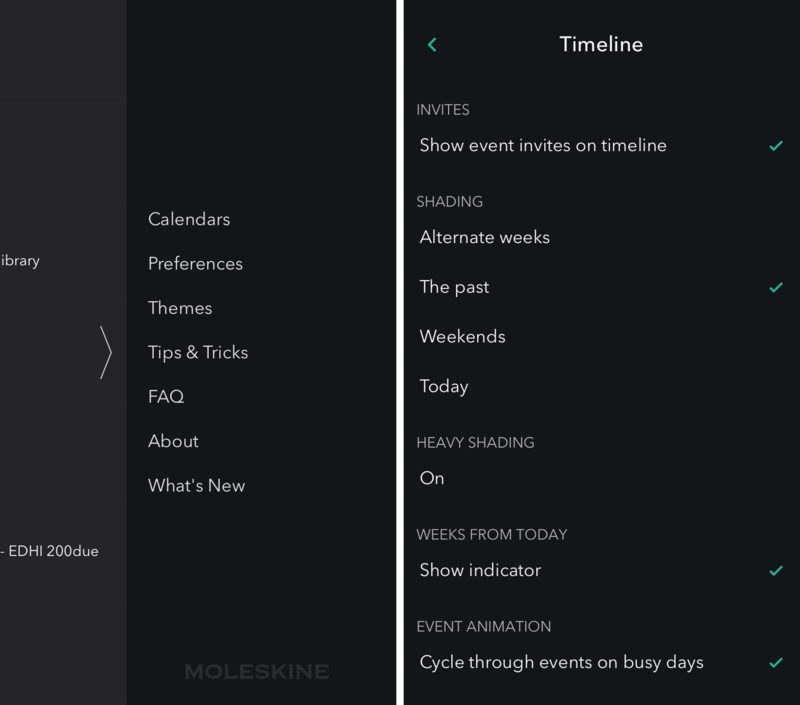 But you may be unfamiliar with Moleskine Timepage, a calendar app that is a step away from the traditional Moleskine image. Through some interesting features and a beautiful interface, there's a good chance that you'll be keeping Moleskine's app development division on your radar. Despite Timepage's name, I'd be more inclined to call the app's biggest feature a timeline. Timepage, through the use of a vertical week view, presents you with a list of what you have to do for the week. Running along the left side, you'll see the current day highlighted along with the next six days in a normal color. To get an idea of what the weather will be like for the week, tapping and holding on any day will bring up temperature highs and lows along with the chances of precipitation. Because of the linear nature of Timepage, you're able to jump backward or forward in time to see events. Checking the weather also works for the future and the past, so feel free to glance ahead at your spring golf outing. If you go too far and need to return to the current date, an arrow will appear either on the top or bottom, depending on which direction you scrolled. Tapping this will catapult you to your week. Let's assume you have a busy day tomorrow – one that's filled with meetings, a sporting event, and dinner with your spouse. For you to stay on top of it all, you need to see where you're going, when you need to leave, and who you're meeting with. You've heard there's a chance of rain, too, so you want to make sure you check that out. Normally, it may take a few different apps to get this done. However, Timepage tries – and succeeds – at being an app that you can find all of this information in. When you tap on a day, you'll see a list of your events with the time and duration listed below. At the bottom, there's a weather symbol and the current temperature. 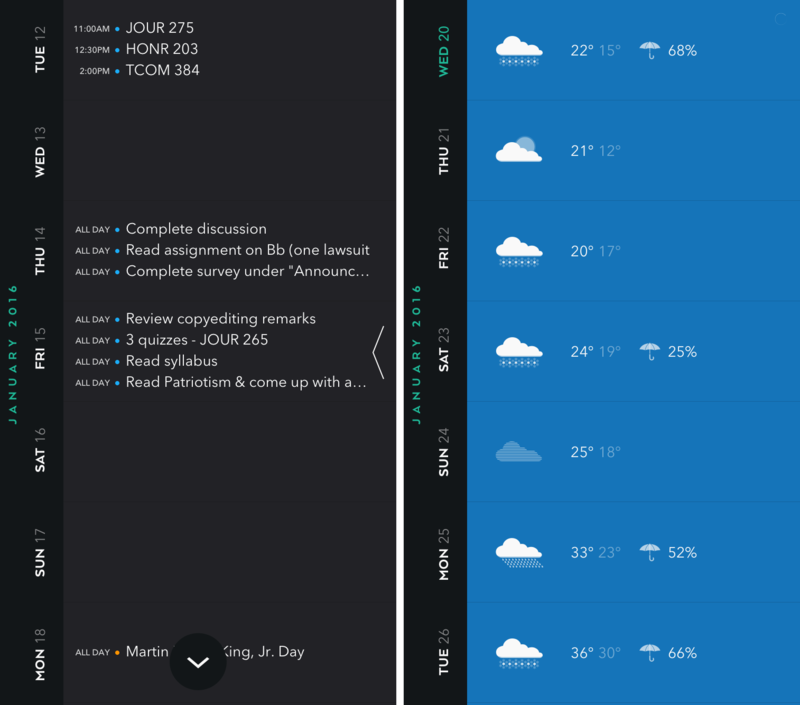 Similarly to the weather gesture in the week view, tapping and holding shows a graph of the temperature and precipitation of the day. Sliding your finger on the line lets you get a better idea of what the weather will be like at a certain time. Tapping into an event opens a new world of information; from a map of the location to the person(s) you're meeting with, you'll find everything you need to be prepared right here. It's an elegant way to provide the necessary details without becoming overly cluttered, and with the ability to add reminders and notes, anything you can't enter into the aforementioned fields can be jotted down and remembered. If you feel like changing up your way of transportation, the app gives different travel methods and even lets you call an Uber from the map. Entering events shines as well, providing you with options galore. While Timepage defaults to one hour time commitments, tapping on the time will prompt you to change the duration of an event, ranging from fifteen minutes to multiple days. When typing in an event, Timepage recognizes names and locations, suggesting possible contacts and places to insert into the event. Occasionally, my thumbs were too fast for the app and it couldn't suggest anything in time. If that happens, Timepage allows you to add that information in the event view. Sometimes, you may want to see an overview of what your month looks like. A traditional calendar sits to the left of the timeline, displaying events at the bottom and a color representing the calendar to which it's assigned. As has been the theme throughout this review, Timepage doesn't settle in terms of functionality. In what Moleskine calls the Month Heatmap, days on the calendar have deeper colors when more events are planned for them. It's really difficult to accurately describe what that means, so refer to the picture below. As you can see, Timepage not only shows events in one color – you can slide through your various calendars to see what kind of events you have during the month. It's a really clever idea and one that's sure to help remember users that their child has a sporting event the coming weekend. 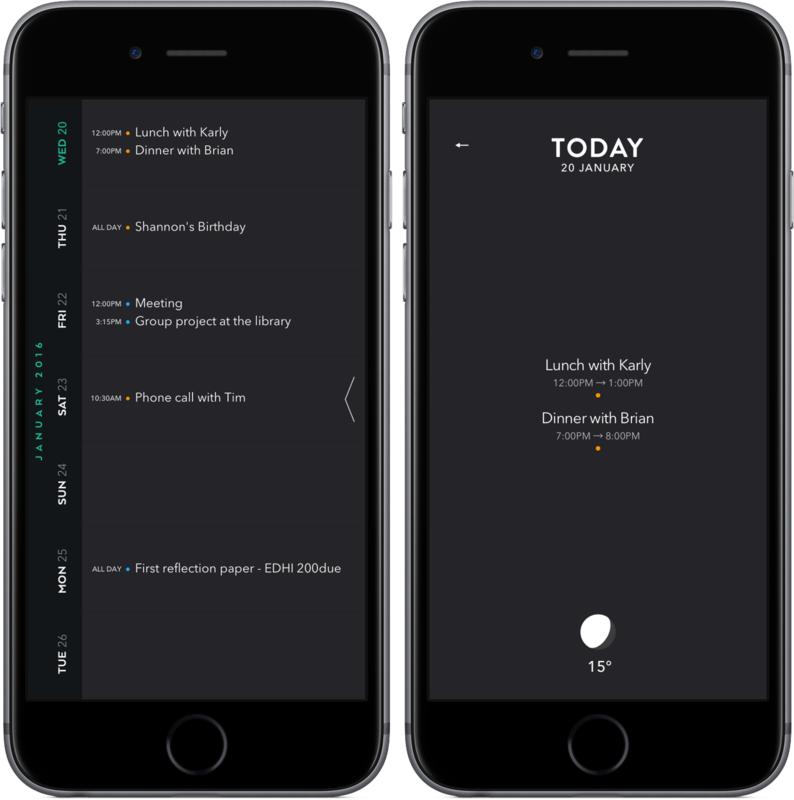 Because calendars are filled with some of the most important events in our lives, having rich customization is necessary to feeling comfortable in an app. Timepage offers a multitude of both visual and functional options that are user-friendly. 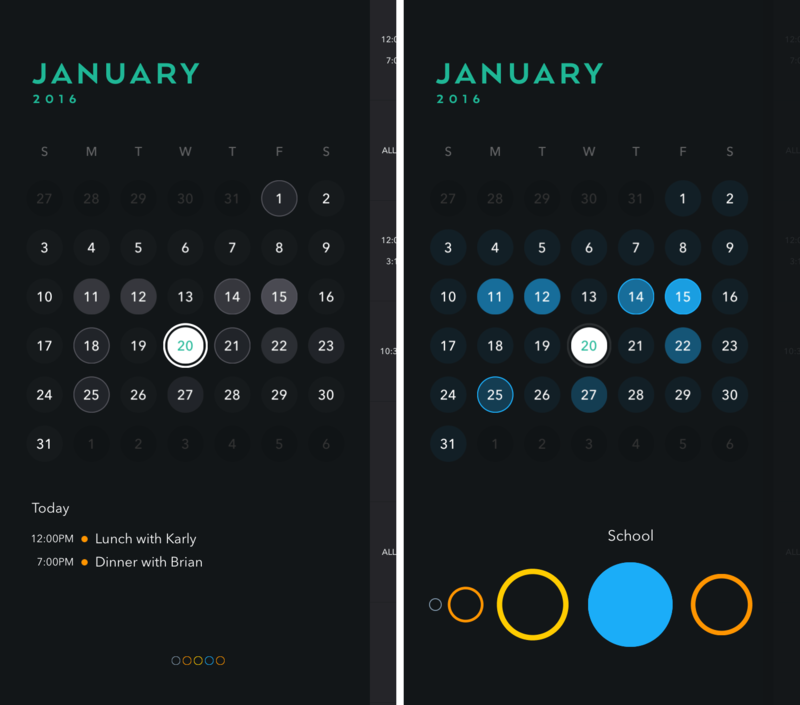 Aesthetically, you're able to pick the color of both the timeline and day view from over fifteen selections. My choice, Luna Black, is great for those who embrace dark mode, but all of the other colors look great too. Frankly, whichever hue you choose, Timepage looks beautiful. If you need to be specific about which calendars you show in Timepage, the Calendars section will let you change visible calendars as well as assign default calendars and change the Month Heatmap to your liking. In preferences, you'll find extensive customization of the timeline, months, events, weather, sounds, travel times, app icon badge, and time settings. For the sake of brevity, I encourage you to peek into these options and see for yourself what they offer. In short: if there's something you don't like about Timepage, poke around here and you'll likely be able to change it. The incredible feature set of Timepage proved to be slightly overwhelming to me at times – and, by the inclusion of the Tips & Tricks menu, the developer recognizes that you might too. Both the "FAQ" and "What's New" tabs are great resources for learning more about Timepage. Unlike the iPad (sigh), the Apple Watch also gets the Timepage treatment. 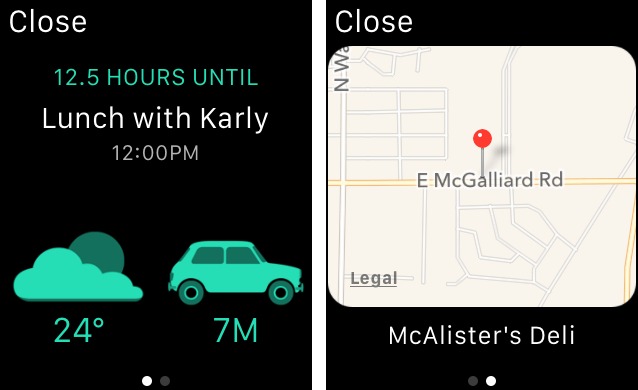 Basically, the Watch app displays your timeline as cards, the events on each day, and what the weather is like. Tapping on an event brings up a forecast and travel time; sliding over brings a map that shortcuts to the Maps app. There's also a complication and glance that both display upcoming events. As far as action extensions go, pressing on the icon brings up options to jump to the next scheduled event, today, or add a new event. In a weird design choice, all of these options are in caps – and it's not pretty. With that being said, it does work. Simply put, Timepage is a brilliant app that can serve as a home for your events and help you manage your calendar. 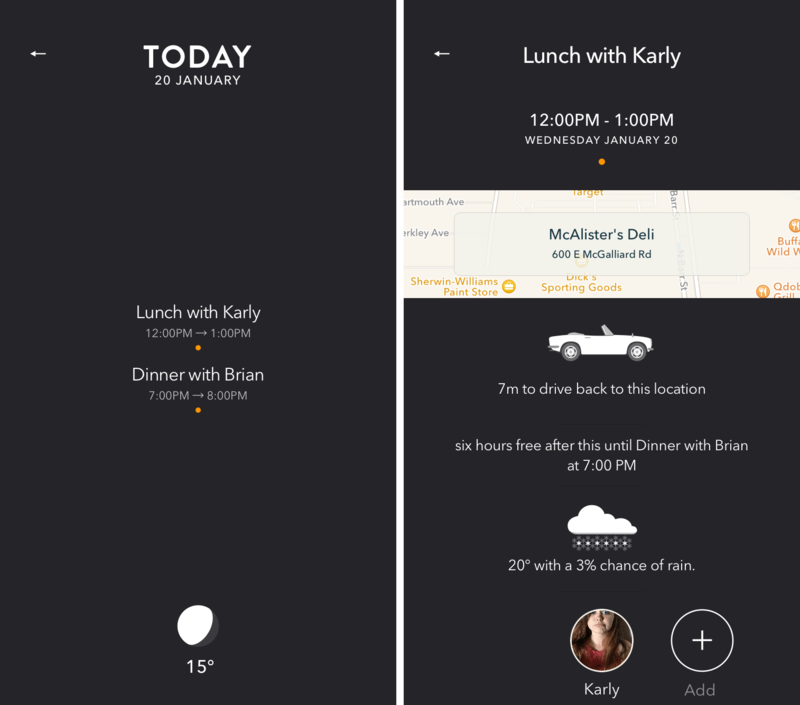 Because of the different time views, there's something for everyone within this app. Even though there's a lack of an iPad version, Timepage can be your next favorite productivity tool. Moleskine Timepage is currently at a discount for $1.99 in the App Store. When full price, Timepage can be found at a still-reasonable $4.99.